We often use gestures to communicate; think of your baby waving ‘bye bye’. Your baby is able to develop and use gestures quicker than they can actually speak, resulting in them being able to use gestures to let you now what they want before they can talk and tell your verbally. Signing is about enhancing, not replacing language and may actually help your baby to talk (babycentre.co.uk). 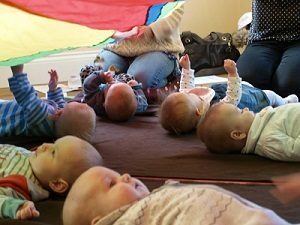 During the 4 week course you will learn a wide range of signs with your baby and use them in singing and reading a story. We will also play with the parachute and musical instruments.